What better way to bid farewell to winter and bring on spring than with a foodie weekend away, meandering the Redcliffe foreshore in search of nibbles, drinks and incredible local entertainment? The gang at G&G is always keen to pack their bags, grab a mate or two and head up north to the incredible bayside city of Redcliffe – especially with the promise of beer tastings, degustation menus, cooking workshops and a whole lot more! Whether you’re looking to save a buck or plan to leave your hardcopy of Barefoot Investor at home, there’s something for everyone with a bunch of both free entry events and paid experiences too. If the idea of a dog café doesn’t get you excited, we don’t know what will! Bring Fido along for a share in the fun and kick-start your Saturday morning with a puppacino and dog treats on the house, courtesy of GRIND. Don’t stress, they’ve got a caffeine fix and brekky for you too. Join the face of Australia’s sustainability movement and SBS hit, River Cottage Australia’s, Paul West working alongside a handful of talented Brisbane chefs as they share Moreton Bay inspired seafood dishes to impress! This is not one to be missed. Moreton Bay Bugs not quite your cup of tea? How about the promise of endless frozen gourmet treats? Head along to the dessert festival and take your pick of sumptuous sweets from an awesome array of local vendors. By this time, we’re sure you’ll be feeling a buzz from the combo of sun, fireworks and sauv blanc. See the night off by pulling into the Mon Komo Hotel for the official after party and a round of icy margaritas. Take in the cool sounds of Brisbane locals, C Major Band who are bound to get you on your feet late into the evening. You’re planning to make the trek out of the big city lights and want to make the most it – well here’s a deal for your. Here at G&G we can never pass up the opportunity of a 5 course degustation paired with some of our favourite drops. Well, Café Diversity’s offer is no different, serving up a range of Asian inspired dishes matched with a variety of wines from Queensland’s, Cutting’s Wines. If it’s something for the kids that you’re looking for, it’d be hard to go passed the cookie decorating workshops, also hosted by Café Diversity. With cookies, confectionaries and fruit juice included, this is a sure fire way to keep the young ones out of trouble for a while perhaps followed by a run around in the sand to burn off that excess sugar. Here’s one for the competitor in all of us! Lagoon Point Café are hosting the ‘Smash It Burger’ Challenge, serving up a monster of a burger with over 10 layers of meat and garnish plus sides and a drink! You’ve got a mere 30 minutes to slay the beast for a chance of a prize and more importantly, being honoured on the ‘Wall of Fame’. 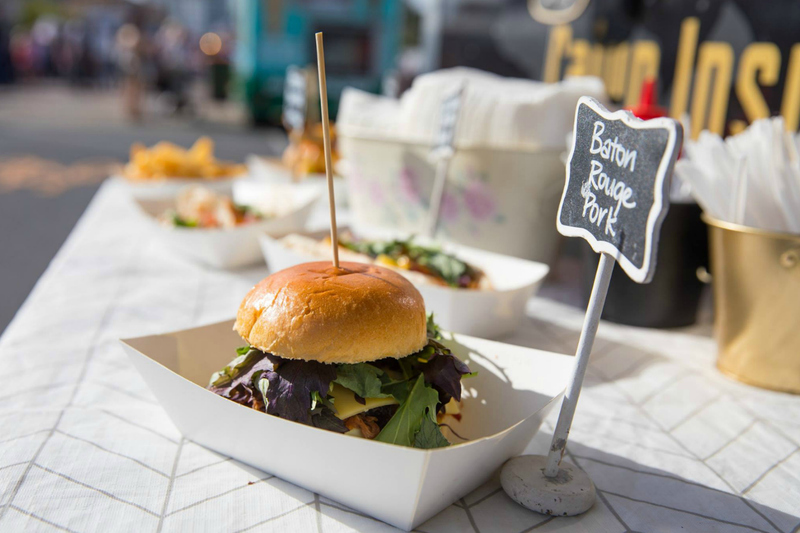 So there you have it, a snapshot of just a few of the offerings at the inaugural Moreton Bay Food & Wine Festival – sure to be action-packed with entertainment, astonishing local produce, take home tips and plenty of drinks on offer. For more information on the timings, prices and all that’s on offer, head here. - the gourmand that's always on time for wine.